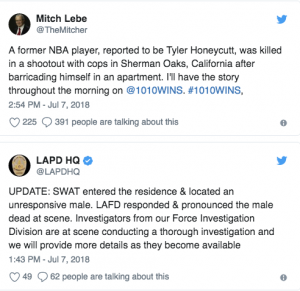 Tyler Honeycutt who plays for Euroleague basketball team Khimki was killed after a shootout with LA police SWAT in his Los Angeles. Honeycutt reportedly barricaded himself in the house for hours after the shootout with the police. When the SWAT entered the house, they found Honeycutt dead. The forward has played with Khimki this past season averaging 9.2 points and 5.4 rebounds in EuroLeague and 10.3 points and 6.4 rebounds in VTB League.